Focused on killing The General, JC Bannister is co-opted into the CIA to “take care” of one of their problems. That problem? The former Deputy Director of the CIA, Ted Williams. But Williams has other plans and forces JC’s hand into a situation with no acceptable outcomes. Will JC do what he knows is right? Or descend into a darkness where there is light? The Fixer, Season 6: Complete is a high-speed, high-stakes action thriller. Fans of Vince Flynn’s Mitch Rapp, Robert Ludlum’s Jason Bourne, LT Ryan’s Jack Noble or Mark Dawson’s John Milton will feel right at home reading this fast-paced international action thriller. When you cross JC Bannister, he brings vengeance to your doorstep. It might not be quick, but it will be violent. With a high-ranking government official as his next target, JC must walk a tightrope. Step one is bringing the man down from his lofty heights before getting justice for his victims. But will his target’s powerful friends, old and new, derail Bannister’s plans before justice is served? Can Bannister wait until it’s safe? Or will he jump the gun to take down the man who killed his friends? 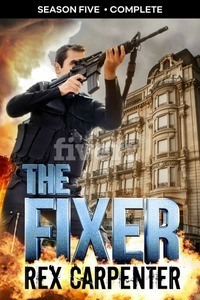 The Fixer, Season 5: Complete is a high-speed, high-stakes action thriller. 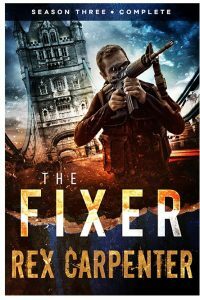 Fans of Vince Flynn’s Mitch Rapp, Robert Ludlum’s Jason Bourne, LT Ryan’s Jack Noble or Mark Dawson’s John Milton will feel right at home reading this fast-paced international action thriller. With assassins on his tail, JC accepts a job that takes him deep undercover into the most dangerous country on the face of the earth. Will he be able to escape from North Korea alive? Or will everything come crashing down and bury him alive, once and for all? 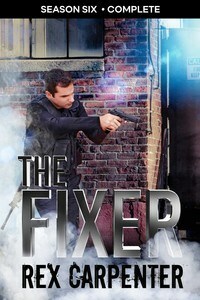 The Fixer, Season 4: Complete is a high-speed, high-stakes action thriller. 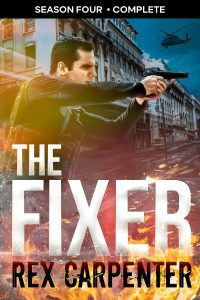 Fans of Vince Flynn’s Mitch Rapp, Robert Ludlum’s Jason Bourne, LT Ryan’s Jack Noble or Mark Dawson’s John Milton will feel right at home reading this fast-paced international action thriller. So, Joan broke in and sent you all an email. I told her she couldn’t swear, no matter how much she wanted to. But she had some important news: Episode 4 is, at long last, released. Don’t forget to leave a review. I’d love it if you went back and left a review of Season 1: Complete. If you’re reading this episode, you’ve more than likely read S1:C. So head here for Amazon Readers, here for Kobo readers, here for Apple and here for Barnes and Noble, and say a few kind words (or unkind words if you hated it). Or pick up a copy if you haven’t already. Thanks all. Working on Episode 5. Lots of chickens to corral so they can come home to roost. Or, you know, something like that. The Fixer, Season 2, Episode 3 is live, baby, live. Barnes and Noble link will be updated when it is live. Go take a gander, find out who Mr. Snow is (if you don’t already know) and see what kind of trouble JC manages to get into. Oh, and leave a review as well, if you’ve got the inclination. And if you feel the need to leave a review for Season 1: Complete…be my guest. So, it’s been a reeeeeaaaaallllllyyyy long time since I published Season 2, Episode 1. Good news – Episode 2 is LIVE!!! Links are below, will update them as the various platforms finish up the digital bits. And one final note – it is priced at 99 cents for the next 24 hours. After that, it’s up to the regular $2.99. Start a war between rival drug lords? Check. Work for a man you hate and want to kill? Check. Protect him from people who want you both dead? Check. JC Bannister, former Army Ranger, hitman for hire, solutionist, fixer, finds himself getting pushed further and further down a path he just wants to burn. But to protect the people he loves and owes his life to, he has to keep it together for just a little bit longer. Long enough to destroy everyone who tried to kill him. 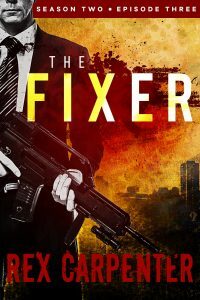 If you like thrillers and heavy hitters like Jason Bourne, El Rey, Tanner, Jet, Jack Noble, Mitch Rapp or John Milton, you’ll find yourself turning the pages of The Fixer, Season 2, Episode 2 like there’s no tomorrow. 0	Season 2, Episode 1 is LIVE!!! Hey guys. I already sent this email out to the people on my mailing list, but forgot to post it. Can’t believe I did that. Why did I forget to post this? Simple – working on Episode 2. Which will come out in November. Holy moly. I just watched the full Star Wars trailer and got all kinds of goosebumps. Gonna go watch it again. Oh, and The Fixer, Season 2, Episode 1 is being edited as I type. Saw this over on YouTube. Tyrannosaurus Rex doing the American Ninja course or something. Found a link to the suit on Amazon. Totally want to get it. Or this Godzilla suit.